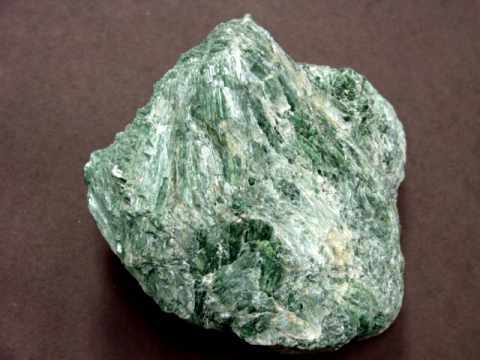 These pages will take a little longer to load since they contain all of our on-line selections of mineral specimens & crystals for all minerals. NOTE: If the images on this page do not load properly (or if they take too long to load! ), then you should visit our Mineral Specimens and Crystals Alphabetical Index where there are links to separate pages for each mineral variety. The images of our mineral specimens & crystals on these specific mineral variety pages will load much faster. Our minerals specimens are sold and replaced on a daily basis, so do come back often! Natural abalone shells collected in the Pacific Ocean with beautiful iridescent colors in shades of blue-green, silver and pink! These abalone shells are composed primarily of calcium carbonate, which was deposited in thin overlapping layers. Reflected light from these layers causes the colorfull iridescence, which is often referred to as mother-of-pearl. We have these beautiful abalone shells available as a special offer in two sizes; large (6"-6.5") for just $14.95 each, and extra-large (7") for only $18.95 each. Please see below to order. Moonstone Mineral Specimen Dimensions: 4.4" x 2.4" x 1.2"
This natural moonstone mineral specimen is unheated and untreated. It is composed of large intergrown grains of translucent to semi-transparent moonstone with some biotite mica. At certain angles, a few of the moonstone grains show natural blue irridescence. Moonstone Mineral Specimen Dimensions: 3.8" x 2.8" x 2.1"
This natural moonstone mineral specimen is unheated and untreated. It is composed of large intergrown grains of translucent to semi-transparent moonstone with some biotite mica. At certain angles, a few of the moonstone grains along one edge show natural blue irridescence. Moonstone Mineral Specimen Dimensions: 4.3" x 3.2" x 2.4"
This natural moonstone mineral specimen is unheated and untreated. It is composed of large intergrown grains of translucent to semi-transparent moonstone with some biotite mica and quartz. At certain angles, a few of the moonstone grains show blue and golden-green irridescence. Moonstone Mineral Specimen Dimensions: 3.2" x 2.9" x 1.3"
This natural mineral specimen is composed of large intergrown grains of translucent to semi-transparent moonstone with some biotite mica and quartz. It is unheated and untreated, and its upper surface has been polished. At certain angles a few of the moonstone grains show golden-green and blue irridescence. Moonstone Mineral Specimen Dimensions: 3.1" x 2.8" x 1.7"
Moonstone Mineral Specimen Dimensions: 1.2" x 1.2" x 1"
This piece of natural moonstone is translucent to semi-transparent. It is unheated and untreated, and it could be used as superior grade lapidary rough to yield very beautiful moonstone gems with strong flashes of natural blue iridescence at certain angles. Moonstone Mineral Specimen Dimensions: 1.8" x 1" x 0.75"
This piece of natural moonstone is translucent to semi-transparent. It is unheated and untreated, and it could be used as superior grade lapidary rough to yield over 40 carats of moonstone gems with beautiful flashes of natural blue iridescence at certain angles. Moonstone Mineral Specimen Dimensions: 1.6" x 1.2" x 0.75"
This piece of natural moonstone is translucent to semi-transparent. It is unheated and untreated, and it could be used as superior grade lapidary rough to yield moonstone cabochon gems with beautiful flashes of natural blue iridescence at certain angles. See also a view of the opposite side of this natural moonstone specimen. Moonstone Mineral Specimen Dimensions: 1.8" x 1.6" x 0.8"
This piece of natural moonstone is translucent to semi-transparent. It is unheated and untreated. It makes a nice specimen of natural moonstone just as it is, although it could also be used as lapidary rough to yield a wonderful carving or many carats of moonstone cabochon gems. Moonstone Mineral Specimen Dimensions: 2.2" x 1.3" x 1.2"
Moonstone Mineral Specimen Dimensions: 2.6" x 1.4" x 0.6"
This piece of natural moonstone is translucent to semi-transparent. It is unheated and untreated. It makes a nice specimen of natural moonstone just as it is, although it could also be used as lapidary rough to yield a beautiful carving. Moonstone Mineral Specimen Dimensions: 2.3" x 2" x 1"
This piece of natural moonstone is translucent to semi-transparent. It is unheated and untreated. It makes a nice specimen of natural moonstone just as it is, although it could also be used as lapidary rough to yield a wonderful carving! Moonstone Mineral Specimen Dimensions: 2.6" x 1.4" x 1.4"
This piece of natural moonstone is translucent to semi-transparent. It is unheated and untreated. It makes a very nice specimen of natural moonstone just as it is, although it could also be used as superior grade lapidary rough to yield some fine cabochon gems with natural blue and green iridescence at certain angles. Moonstone Mineral Specimen Dimensions: 3.2" x 1.7" x 1.1"
This piece of natural moonstone is translucent to semi-transparent. It is unheated and untreated. It makes a great specimen of natural moonstone just as it is, although it could also be used as lapidary rough to yield a beautiful carving! Moonstone Mineral Specimen Dimensions: 3.3" x 1.8" x 1.6"
This rough specimen of translucent moonstone weighs 1/2 pound! It is unheated and untreated. It makes a great specimen of natural moonstone just as it is, although it could also be used as lapidary rough to yield beautiful cabs or a single large carving! Moonstone Mineral Specimen Dimensions: 3.3" x 2.1" x 1.7"
This piece of natural moonstone rough is unheated and untreated. It has areas of superior lapidary grade and would yield over 400 carats of cabochon gems or an amazing carving. See also a view of the opposite side of this moonstone lapidary grade rough specimen. Moonstone Rough Specimen, 2280 carats! Moonstone Mineral Specimen Dimensions: 4.2" x 2.4" x 1.9"
This large rough specimen of translucent moonstone weighs one pound! It is unheated and untreated. See also a view of the opposite side of this large moonstone specimen. 3" long x 2.3" x 1.4"
This natural andalusite mineral specimen was mined in Minas Gerais, Brazil. 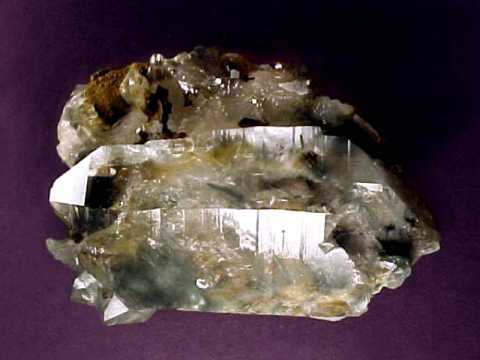 The matrix is white semi-transparent quartz with numerous andalusite crystals. Some of the andalusite crystal's tips are in fair to good condition and have tiny gem grade areas with pinkish-brown to greenish colors depending on lighting and orientation. Andalusite in Matrix Specimen Dimensions: 3" long x 2.5" x 2.2"
This natural andalusite mineral specimen was mined in Minas Gerais, Brazil. The matrix is white semi-transparent quartz with several large intergrown andalusite crystals. Some of the andalusite crystal's tips are in fair to good condition and have tiny gem grade areas with pinkish-brown to greenish colors depending on lighting and orientation. The photo at left shows a close-up view, see also a full-view photo of this andalusite with quartz matrix specimen. Andalusite in Matrix Specimen Dimensions: 3.6" long x 3.6" x 2.7"
This natural andalusite mineral specimen was mined in Minas Gerais, Brazil. The matrix is white semi-transparent quartz with several large intergrown andalusite crystals. Some of the andalusite crystals have tiny gem grade areas with pinkish-brown to greenish colors depending on lighting and orientation. See also a another image of this andalusite mineral specimen. Andalusite in Matrix Specimen Dimensions: 5.7" long x 3.3" x 3.0"
This natural andalusite mineral specimen was mined in Minas Gerais, Brazil. The matrix is white semi-transparent quartz with dozens of large intergrown andalusite crystals. Some of the andalusite crystal's tips are in fair to good condition and many have tiny gem grade areas with pinkish-brown to greenish colors depending on lighting and orientation. The photo at left shows a close-up view, see also a full-view photo of this natural specimen of andalusite crystals in quartz matrix. Copal Amber Dimensions: 2" long x 1.2" x 0.5"
This hand-polished piece of natural copal amber was mined in Colombia. It formed from ancient tree sap which hardened over time after falling to the earth over 1,500,000 years ago and becoming buried by sediments. It is transparent and has beautiful golden-yellow color. This genuine copal amber specimen has very good transparency for viewing the small insects within it! There is some organic debris, some insect body parts, and some 1.5 million year old flying insects in this specimen. See also a full view photo of this natural copal amber with insects specimen. Copal Amber Dimensions: 2.5" long x 1.9" x 0.6"
This hand-polished piece of natural copal amber was mined in Colombia. It formed from ancient tree sap which hardened over time after falling to the earth over 1,500,000 years ago and becoming buried by sediments. It is transparent and has beautiful golden-yellow color. This genuine copal amber specimen has very good transparency for viewing the small insects within it! There is some organic debris and a couple of 1.5 million year old termites and a small beetle still trapped in this specimen. See also a full view photo of this natural copal amber with insects specimen. Copal Amber Dimensions: 3.7" long x 2.2" x 0.7"
This hand-polished piece of natural copal amber was mined in Colombia. It formed from ancient tree sap which hardened over time after falling to the earth over 1,500,000 years ago and becoming buried by sediments. It is semi-transparent to transparent, and it has beautiful golden-yellow natural color. This genuine copal amber specimen has a natural hole passing all the way thru it, and it has several small 1.5 million year old insects still trapped in this specimen. See also a full view photo of this natural copal amber with insects. Copal Amber Dimensions: 3.5" long x 1.8" x 0.8"
This hand-polished piece of natural copal amber was mined in Colombia. It formed from ancient tree sap which hardened over time after falling to the earth over 1,500,000 years ago and becoming buried by sediments. It is transparent and has beautiful golden-yellow natural color. This genuine copal amber specimen has very good transparency for viewing the insects within it! There are a few small 1.5 million year old insects inside including an ant and a mosquito still trapped inside this specimen. See also a full view photo of this natural copal amber with insects specimen. Copal Amber Dimensions: 3.3" long x 1.9" x 0.8"
Copal Amber Dimensions: 3.5" long x 3" x 1.3"
This hand-polished piece of natural copal amber was mined in Colombia. It formed from ancient tree sap which hardened over time after falling to the earth over 1,500,000 years ago and becoming buried by sediments. It is transparent and has beautiful golden-yellow natural color. This genuine copal amber specimen has very good transparency with a natural hole passing all the way thru. There are a couple of 1.5 million year old termites still trapped inside this specimen. See a close-up view of another termite in this genuine specimen of copal amber with termites. See also a full view photo of this natural copal amber with insects specimen. Amblygonite Mineral Specimen Dimensions: 2.8" x 2.1" x 1.8"
This piece of lithium-rich amblygonite was mined in a tourmaline bearing pegmatite in Minas Gerais, Brazil. It has rare blue-lavender color (100% natural color), and it is mostly translucent with some small semi-transparent areas. Amblygonite Mineral Specimen Dimensions: 4.7" x 3" x 2.4"
Amblygonite Mineral Specimen Dimensions: 4.2" x 3.1" x 2.2"
This piece of lithium-rich amblygonite was mined in a tourmaline bearing pegmatite in Minas Gerais, Brazil. It has rare blue-lavender color (100% natural color), and it is mostly opaque to translucent with some small semi-transparent areas. 5.2" x 4.4" x 4.4"
Amblygonite Mineral Specimen Dimensions: 6.8" x 5.3" x 2.8"
Amblygonite Dimensions: 1.2" x 0.9" x 0.4"
This small specimen of pale yellow lithium-rich amblygonite has a relatively thin flat shape. This natural amblygonite specimen was mined in a tourmaline bearing pegmatite in Minas Gerais, Brazil. It has 100% natural color, and it is transparent. Amblygonite Dimensions: 1.3" x 0.9" x 0.7"
This pale yellow specimen of lightly included lithium-rich amblygonite was mined in a tourmaline bearing pegmatite in Minas Gerais, Brazil. It has 100% natural color, and it is transparent. Amblygonite Dimensions: 1.8" x 1.2" x 0.7"
This piece of lithium-rich amblygonite was mined in a tourmaline bearing pegmatite in Minas Gerais, Brazil. It has pale yellow color (100% natural color). It is mostly transparent. Amblygonite Dimensions: 1.9" x 1.3" x 1.2"
This piece of lithium-rich amblygonite was mined in a tourmaline bearing pegmatite in Minas Gerais, Brazil. It haslight yellow color (100% natural color) with some terminated surfaces. It is mostly semi-transparent. Amblygonite Dimensions: 2.2" x 1.8" x 1.95"
This piece of lithium-rich amblygonite was mined in a tourmaline bearing pegmatite in Minas Gerais, Brazil. It has pale yellow color (100% natural color), and it is semi-transparent. Amblygonite Dimensions: 4.1" x 2.3" x 1.9"
This piece of lithium-rich amblygonite was mined in a tourmaline bearing pegmatite in Minas Gerais, Brazil. It has light yellow color (100% natural color), and it is semi-transparent with some small transparent areas. Amblygonite Dimensions: 3.9" x 2.2" x 0.6"
This piece of lithium-rich amblygonite has a relatively thin flat cleaved shape. It was mined in a tourmaline bearing pegmatite in Minas Gerais, Brazil. It has light yellow color (100% natural color), and it is mostly transparent. Amblygonite Dimensions: 3.6" x 3" x 2.3"
This natural specimen of lithium-rich amblygonite has light yellow color (100% natural color), and it is semi-transparent with some small transparent areas and some terminated surfaces. See an other view of this natural color yellow amblygonite specimen. Amblygonite Dimensions: 5" x 4.3" x 2.9"
This natural specimen of lithium-rich amblygonite has light yellow color (100% natural color), and it is semi-transparent with some small transparent areas. Amblygonite Dimensions: 5.5" x 3.3" x 3.2"
This natural specimen of lithium-rich amblygonite has light yellow color (100% natural color), and it is semi-transparent with some small transparent areas and some terminated surfaces. This is the end of page 1 of our Mineral Specimens of All Minerals virtual gallery pages. See also our page #2, page #3, page #4, page #5 & page #6. Would you like us to inform you when we add more naturally terminated mineral specimens, clusters and crystals on this page? We have an extensive inventory of natural mineral specimens, crystals and matrix specimens at our gem & mineral warehouses, so be sure to let us know if you have any special requests. Please contact our webmaster or our 'site' geologist with any questions or comments.